The voice -communications industry has long-lacked a total solution for providing secure and verifiable communications. After the creation of the internet, businesses and individuals quickly looked for ways to conduct commerce and other types of transactions that required a reliable standard for quickly and securely transmitting information. There are still many important transactions that occur by phone or voice today that demand the same type security solutions enjoyed by participants in internet commerce. There is no reason that voice communications should be continued to be neglected and it is my belief that by using the robust and mature internet security protocols as a model, a new paradigm of secure voice communications can be established. 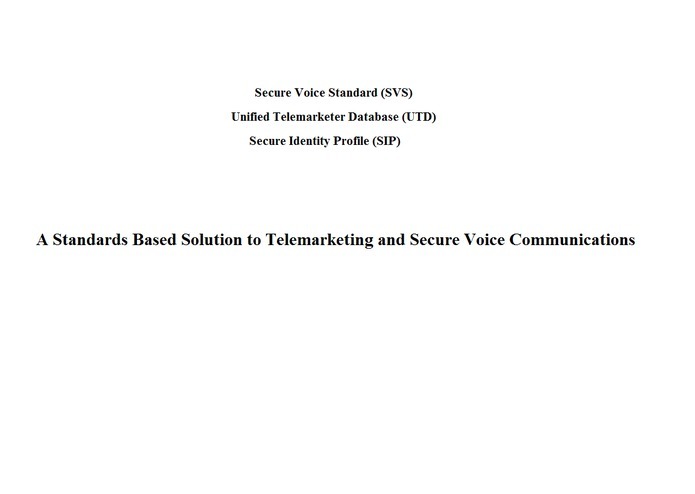 It is a complete model that both prevents fraudulent or unlawful calls and enhances the viability of voice communications as a secure method of commerce and inter-entity communication.